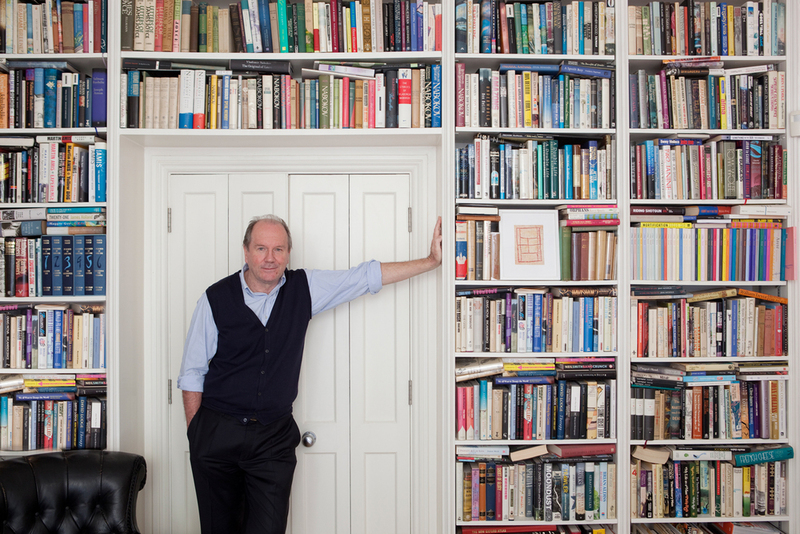 I had the good fortune recently to spend some time with the British author William Boyd in his Chelsea home. L'Express magazine were doing a piece about William and his new JamesBond book, Solo. It was hard to take a good picture of William, not because he isn't patient, or that he's shy in front of the camera; but because he was so fascinating to chat to. It was hard to concentrate when all I wanted to do was pull up a chair and hear about his life. It turns out that one of his passions is photography, and the book he's currently working on is about a 19th century photographer. He's also been photographed by the great and good of photography, such as Richard Avedon, David Bailey and Rankin. And now Woolfall of course. I did a few set ups in William's front room working with daylight and the impressive book shelves. We shot some wide portraits in his upstairs lounge using a beautiful ornate Victorian mirror and I did a few shots with my lights gelled up to try something a little different.